There are little things we eat all day long that cause some of our daily problems like pimples, bloating, gas, etc. There are some foods you should eat instead of maybe your normal routine breakfast, that will help these things not happen on your wedding day. 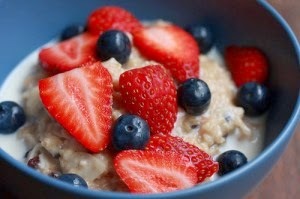 You can start your morning with one cup of steel cut oats, and mixed berries. The oats will give you the energy you need. Avoid sugary drinks and alcohol until the wedding. Your blood sugar will spike and you might get fatigued in the middle of your wedding. Through out the day you should drink water with lemon. Its a great cleanser and will keep your skin nice and hydrated. You can also try out this recipe for a breakfast smoothie! Add all ingredients to blender and blend till smooth and creamy.